Now where was I? Oh! It's 8PM and it's still raining! Wow, talk about the first ever whole-day rainfall. Times like this make me just want to bum around in the living room all day. Which is what we did, actually. We've been glued to the TV set since we woke up, alternating between DVDs and regular shows, and visiting the kitchen for some grub once in a while. While I tried to figure out how my blog template worked later in the afternoon, my wife and our visitors decided to play tong-its, a local card game which is really interesting. Especially if there's cash to be won. The game was so engaging that they played til it was dinner time. They have left a few minutes ago, and my wife and I are back in front of the TV. It's sooo relaxing to not think about anything and let the day leisurely pass by once in a while. And a while back, our neighbor dropped by to give some party food! It's his youngest son's birthday. 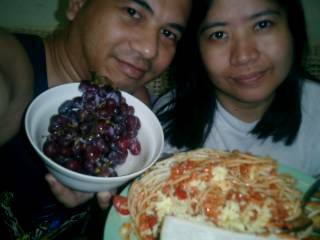 So now, we're having spaghetti, chicken, and ice cream (we were supposed to munch on grapes only): a mini feast to cap-off the last day of the long weekend. This afternoon, we watched a PBA (Philippine Basketball Association) tournament. There was nothing to it really, it's just the country's favorite sport, and the main event featured Ginebra, the most popular team ever. We arrived at the Cuneta Astrodome at 3:30 PM. It was only later that I learned that we were going to sit through the two games. I really didn't care much for the first game, so I amused myself by eating. I had forgotten to bring my Nokia N-gage, so when I had read through most of the latest ish of the Culture Crash comics, I resorted to paying closer attention to my stomach. Which has a side effect: drowsiness. So I rested my head on my wife's shoulders and slept while the fans shouted and cheered for their teams. Yeah, I can be shameless sometimes. 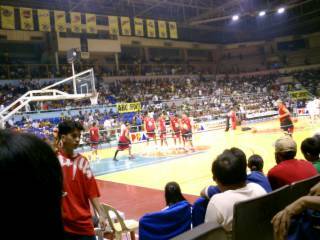 When the main event (Ginebra vs Alaska) came on, I was ready to do my part in cheering Ginebra on to victory. They had quite a substantial lead at the first quarter (around 19 I think), which steadily dwindled til it only became 5 by the third quarter. By the fourth quarter, Alaska was able to valiantly catch up, and the game went into overtime! Suffice to say, Ginebra lost. Bummer. But I had fun overall. It was great booing the Alaska fans who would shout "Alaska, go go! ", so much so that the Ginebra fans were pre-empting this chant and was already booing even before they opened their mouths. The way my wife and I were making excited gestures and making commentaries, we're a shoo-in as hosts of the game. This is the second time I have witnessed a live PBA game, by the way. And my advice to you is, if you are ever going to buy tickets, make sure you are either in the middle or lower bleachers. The first time I watched a game in Araneta Coliseum, we were in the upper bleachers. It gave us quite a headache looking down, squinting, and regularly scanning the court from side to side to catch the action. 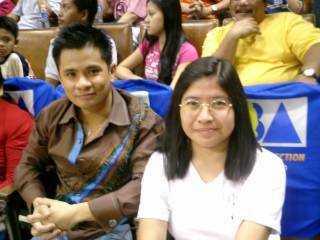 At the half-time, by the way, my wife became star-struck once again, and was able to have her photo beside Mr. Ogie Alcasid (singer / songwriter / actor / comedian) who swooned the audience with a song from his new album, and a shot of the beautiful Ms. Aubrey Miles, who was there to promote her new horror movie (undeniably influenced by the asian hit horror films trend) by rendering a song too. Now here I am, writing this journal in advance as the clock nears 12 midnight. This coming week is going to be pretty busy for us since the company golf tournament is on the 26th, so my next entry might already be next Saturday. Til then, gotta catch my z's! The rest of the guys are my father's drinking buddies. The lady in front is a good family friend. I remember us spending a night at her place one time. She had lots of Funny Comics stored (famous during that time). I practically spent my entire time there reading about SuperKat, Bing, Bam, Bum and Niknok. In the morning, she cooked us scrambled eggs for breakfast, the kind that you scramble on the frying pan while cooking. I loved the way it was done, and I prefer the eggs done that way til today. Stopping at one place after the Divi challenge was a relief! The lady at the left was the Saturday birthday girl, and the shy gal at the right is our kind-hearted guide. 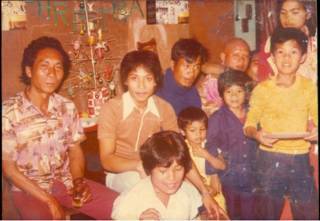 The lady in the middle had her wedding in Quezon previously, which we all attended. Last Saturday, we went to my wife's friend's birthday party near the University Belt. 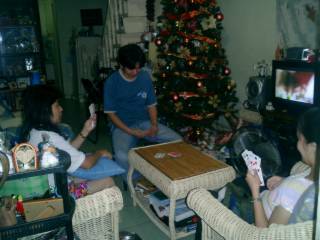 After a series of wacky charades, videoke, and tong-its (a local popular card game), the conversation was turned to nice finds at Divisoria. Our host proudly showed us various Christmas decors and gift items that were practically a steal. 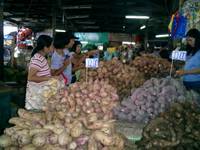 Enticed by the price and the variety of items on sale, we decided to visit Divisoria ourselves with a couple of other friends, which includes the celebrant. Yesterday was officially declared a special non-working holiday in commemation of the conclusion of Ramadan for our Muslim brothers. It was the perfect day to visit Divisoria! Fast-forward to yesterday (hmmm). We found ourselves waking up to the 6:00 alarm clock. We were to meet the ex-birthday celebrant at the D. Jose station of the MRT by 7:30, and Tina's other friend, who knows Divisoria like the back of her hand at McDonald's. We had to be early so as not to get caught up in the human taffic jam. A quick jeepney ride and all four of us were ready for the buying adventures that lay ahead. We made our naughty-and-nice list the night before, and this we trustily referred to from time to time. Turns out that 8:00AM is not so early after all. There was already quite a crowd in the area when we arrived. We hastily made a beeline for a building that was loaded with toys. My kind of place! We stopped by the first store and were amazed at the low prices. Our 'guide' motioned us to visit the other stalls before making our purchases, and that we did. 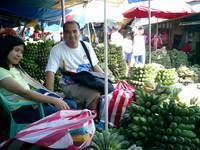 In Divisoria, you get to hone your negotiating skills to shave-off a couple of pesos from the asking price. But being the only thorn amongst the roses, I let them exercise their bargaining power. I wasn't really able to do much shopping on my part because an auditor was on board :-). We stopped by McDonald's for a quick snack after a couple of hours and a moderate amount of purchased goods in hand. When we left the store half an hour later, the crowd had increased over tenfold! Apparently other people had the same idea as we have when Monday was declared a holiday. We wanted to buy some stuff at the clothing store in another mall, but managing to squeeze in and out of the crowd was tough. We tried just a couple of stores and were finally able to buy a couple of shirts for the kids. Whew! When we stepped out of the building, the mass of people milling about was overwhelming. The different noise, smells, and the heat can drown out your senses. I would usually get agitated in such situations, but the trick, I learned, is to take it easy and 'go with the flow'. Also, it makes good sense to keep your bags and your wallets close to you. Better safe than sorry. Lunchtime saw us at a nearby foodcourt and we made a couple more stops after that. Boy, you really need a lot of stamina to pass the Divi challenge. It's only been half a day and already my feet were killing me! 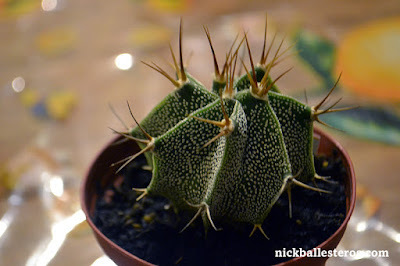 Or is it Mother Nature keeping up with me? Our last stop is the fruit stall of our 'guide'. Their area is where fruits are dropped off. There were mounds upon mounds of bananas, the kind that is used in cooking (we call it 'saba'). There were also coconuts, mangoes, loads of barbeque sticks, and of course, the sweet potato, known here as the 'musical fruit', as it is known to give you gas after eating a moderate serving. 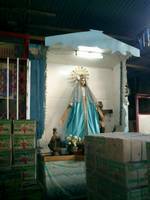 It was a surprise to see an altar of the Virgin Mary in the midst of the boxes of fruits and sticks, a dominant figure amidst the humdrum of the busy community. 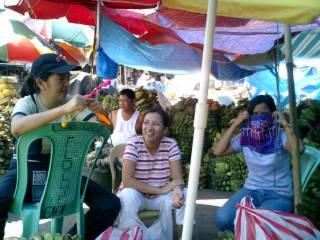 Our 'guide' gave us a bunch of bananas and pineapples as a parting gift (pasalubong). She's such a nice gal. When we got home at around 5PM, we slumped into the living room sofa, exhausted from the trip. But happy. It was a unique experience, this Divi challenge. We caught the 10:30 screening of 'The Incredibles' last night. And boy, the movie was lots of fun! The concept and storyline is a classic good vs evil with some clever twists within (who would have thought of super heroes getting sued!?). The characters are endearing and humane, the graphics top-notch. And the adventures! Not a single boring moment. The movie was worth sleeping late and waking up very early this morning (we had to go to a golf and country club for ocular inspection). I want to talk about specifics but I might give away the plot and drop some unwanted spoilers, so I'll just say, watch it! But don't take my word for it, visit rottentomatoes.com (my favorite movie database site) and read the reviews! Pixar Animation does it again. Go catch it in theaters while it's still on! Wow I'm feeling oh-so blessed in the material sense these days. I do hope this trend lasts til the New Year! A couple of weeks ago, I got an X2 United DVD. This time around, I got a Star Wars trilogy DVD Set from another good friend! Nope, I don't make grave threats to get these presents; it was for my birthday. I have been watching the bonus disc and it's filled with lots of goodies on behind the scenes and documentaries. There's even an extensive discussion and raw footage on the climactic battle between Obi Wan and Anakin for Episode 3. "Revenge of the Sith" is one of my most highly anticipated movies of all time! I'm a big Star Wars fan, and I know so because I don't get tired watching the movies over and over til I practically can repeat the lines, while my wife musters a raised eyebrow and asks, "is there anything else to watch?" I noticed a definite change in Return of the Jedi: at the last part where Obi Wan, Yoda, and Anakin appears, the old Anakin was changed to the long-haired character of Hayden Christensen for Episode 3. It's the old man no more. And a few moments ago, we got to watch the trailer of Episode 3 off the Internet. It looks great! The even better news is that wookies are appearing in the movie. Prior to the release of Episode 1, news was being circulated that Chewbacca or his kind will not see airtime in Episodes 1 to 3. In fact, Chewbacca even gets killed in a novel tackling a storyline after Return of the Jedi. It was quite a bummer. Heck, he didn't even get a medal in A New Hope when he was just as instrumental in the victory as the others were! But the quick shot of a couple of wookies appearing on the trailer of the new Star Wars movie is indeed a delight. And there was even an X-Wing fighter shown in the space battle! This is one movie I can't wait to see. 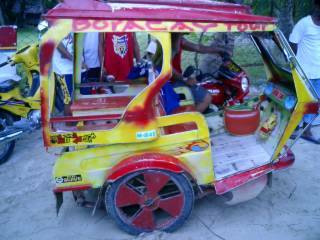 Tricycles (or pedicabs, as they are also called) can be found in most places of the Philippines. I have yet to see one in Baguio, though. This mode of transportation is easy to use and you virtually rent the vehicle for yourself in the duration of your trip (though in some areas, it becomes a smaller version of the jeepney; anybody can take a ride with you given a fixed route). There are also various designs of the pedicab, with the main difference mainly on its passenger capacity. 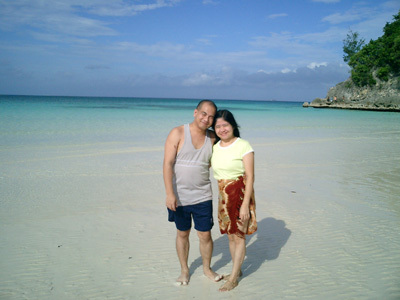 The photo is taken from our recent trip in Boracay. There were six of us, and our seating arrangement is thus: 2 in front, 3 at the back seats, and 1 behind the driver. However, you'll notice that the coach is rather slanted upwards. So you'll have to achieve a 'weight balance', especially since it was an uphill climb to the place where we were staying. One time, we were taking a ride to our place, and the road wasn't exactly paved. The ladies can't avoid making stifled screams and looks of panic as we made our way amongst potholes. The driver stopped mid-way then requested one of our companions to move to the front seats. He was a large, heavy-set man, and he muttered that he knew he was going to be noticed, what with the pedicab lurching upwards everytime it crosses a 'crater'. The smiles and giggles were later replaced by panic again as we moved on, though the vehicle didn't lurch as much. By the second ride, everyone knew where they're supposed to be seated. At another time, we were unfortunate to take a pedicab with a motorcycle that had seen better days. So the engine was really making a lot of noise as we went uphill, with the whole frame violently rocking each time we crossed uneven sections in the road. His loose change were also flying all over the place onto the road, which he didn't seem to mind! We clung on to dear life, and the ladies said, 'Mama, baba nalang kami!' ('We're getting off! '), and they were already trying to get out while the pedicab was still running. And some of us walked the rest of the way uphill while the pedicab moved on, stopped at the levelled, concrete road, and waited for us. The weird part is, we nevertheless used the pedicabs on our trips from the resort to the beach and vice versa for the duration of our vacation. Must be because we got so tired walking around buying pasalubong and food that we momentarily forgot how it was to take a ride until we were already on the uphill climb. Finally! The decoration has been adorned with trimmings. The most difficult part of the process was making sure the ribbon spans the entire length of the tree, and that the Christmas lights should also adequately cover the tree. We did not put that many lights in it; I used 5 cords of lights with 100 bulbs each, totaling 500 white, steady lights. 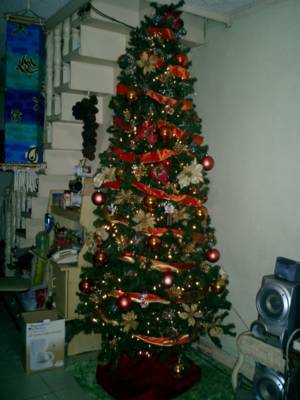 I have finally put up the Christmas tree in our living room. And since it is rather humongous in size, I really can't put it anywhere else other than under the stairs, as it has been for the past two years. I was supposed to buy a smaller one but when I went back for it that weekend, it was already out of stock! I didn't want a smaller one, so I took this tree. As a kid, putting up the Christmas tree was always memorable. 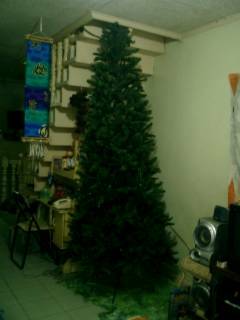 Our tree then was only 1/4 the size of what I have right now. And prior to the "pine tree look" trend, our original Christmas tree that only had thin strips of twisted aluminum for branches, and everything was aluminum. We'd wedge it into a can with stones in it and decorate the can itself with Christmas wrapping paper. And then we had these plastic ornaments that looked like chinese lamps. 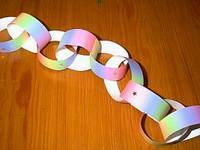 I remember we'd cut strips of colored paper, interloop them up then paste two ends and voila! A nice garland for the tree. We also hanged candy canes and assorted sweets, which invariably disappear faster than you can say, "holy guacamole!". Our parents didn't mind what we hung on it, which made it really fun. We even made our own Christmas lanterns out of Japanese paper and bamboo sticks! From our home to yours, advance Merry Christmas! What shall we have for lunch? Tinola! M-mmmm! Tinola is certainly one of my favorites. And Babes (a good friend) definitely makes one of the best-tasting tinola around. She made one unforgettable meal last year in Baguio, and we wanted her to do it again in Boracay. And so we were treated with Tinola for lunch! 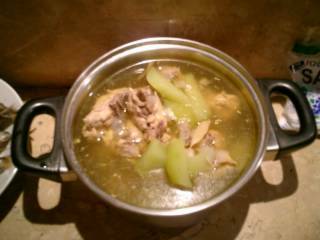 Tinola is a local recipe with chicken as its main ingredient, swimming in a chicken soup base along with dahon ng sili (leaves of the pepper plant) and either papaya or sayote. Tinola is so loved that it is even mentioned in one of our National Hero, Dr. Jose Rizal's writings. Coming from Baguio, I have acquired the taste of sayote in tinola, with its sweet taste wonderfully enhancing the overall aroma and taste of the dish. And to complete the experience, we have some patis (fish sauce) to dip the chicken and sayote on. Others, however, prefer the papaya over sayote. If you have a preference, you will immediately notice which was used on first bite, even if the two look very similar. Hmmm... what's the english term for sayote, anyway? By the way, don't be offended if we Filipinos suddenly spoon-up the soup and pour it all over the hot, steaming rice. Or, horror of horrors, pour seasoning onto the chicken and veggies on our plates! The dish may taste prfectly fine, but we do love putting seasoning on anything! It's completely normal. So here's to tinola no matter which vegetable you prefer it with! A colleague bought me an original X-Men 2 DVD as a present from an unclaimed Kris Kringle gift of two Christmases ago. It's one of the movies I really love and having the original DVD, along with the bonus disc, is a special treat. When I played the disc last night, I was in for more surprise. Included in the subtitles is Tagalog! Wow, how cool is that?! We tried the Tagalog subtitle and was pretty amused by the interpretation. Pretty accurate, though. However, I found it quite a challenge to read through the subtitle, and made it actually difficult to understand the movie. So after around 15 minutes, we switched off the subtitle. Nice touch though. It means Tagalog (or Filipino, as is now officially known as our national language) is finally being recognized worldwide. Must be because you can spot a Filipino in virtually every corner of the globe. When I arrived yesterday at work, there was already a meeting ongoing for the School of -hack (a two-week technical training we are organizing). My colleagues were threshing out the details and accounting stuff. So I joined in the meeting to see how things are, and help out in the action items. At around 11, I was finally able to properly sit down at my cubicle and check my e-mails. 280 in all! I had barely sifted through the spam when the head of the Golf Organizing Comittee went to my place and started discussing details. Thank goodness some of the work had already been done by the other people here in Marketing (there's 3 of us). However, there was still much to do, and we found ourselves having lunch outside and promptly going into golf shops looking for prizes. The afternoon was pretty much the same, with me juggling details for the School of -hack, the Golf Tournament, our sponsorship for a conference, an upcoming Cisco Systems seminar, answering business e-mails, and I haven't touched the Christmas giveaways yet! Which is why I am writing this entry at 1:31AM because I'm not yet finished with the major re-arrangements of our living room. Plus I had to fetch Blackie (the car) at 12:30AM from my friend's parking space where we stayed for the duration of our vacation. My star-struck wife was all excited when we got home because she wanted to have these photos with celebrities blogged. So here it is! 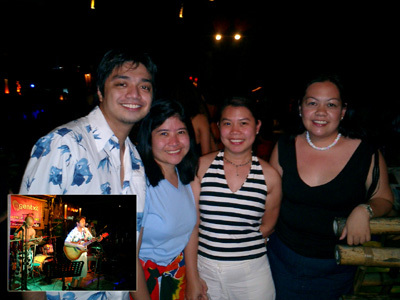 First photo is with Acoustic Performer Nyoy Volante (with an inset of his performance at Pier 1), the next one below is with Randy Santiago, who was celebrating the opening of Ratsky at Station 1, and finally, with actress Claudine Barretto. The other two gorgeous ladies in the photos are friends Honey and Babes. We also saw a bunch of other celebrities. The ladies went ga-ga over Mark Nelson, while we guys oggled over Ms. Katya Santos. We also saw Gwen Garci and Jen Rosenthal. 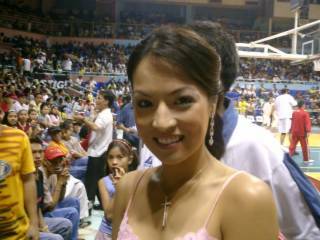 Tuesday Vargas was also there, as well as the beautiful Bianca Araneta. *Sigh* we weren't able to take photos. Sayang! 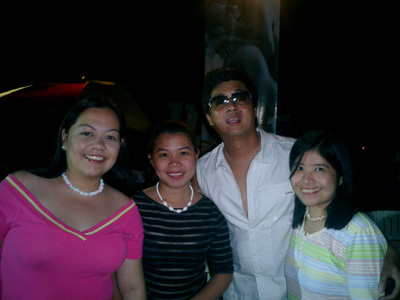 And then there was Dennis Padilla with the kids; they had snacks in the same place we were taking a break from shopping. Of course we didn't ask Mr. Padilla for a group photo, dyahe naman, he's spending time with his family. Raymart Santiago was in the Ratsky opening as well. And finally: Ms. Sunshine Dizon was in the same flight as we were in going back to Manila. I wasn't able to blog as was originally planned, but we're back in Manila safe and sound to surprisingly non-traffic roads (this is my first time to spend All Souls Day on Manila in ten years of residing here). We spent our vacation in Boracay! It's so nice to be back after two years (we spent our honeymoon here, and wanted to go back ever since). It still amazes me how the find white sand is cool to the touch even under the blazing afternoon sun. And the sunset is as breathtaking as ever! And of course there's the customary shopping for pasalubong (although this time it was more controlled because I was with an auditor ^-^), and we had a couple of night-outs and met some really cool celebrities! I'll add those posts in later.